This product is by Yoplait. The box says portable lowfat yogurt, freeze n' go...thaws by lunch. It is so colorful attracting kids attention at the supermarket with some boxes having pictures of their favorite cartoon character like sponge bob. My daughter loves this so much that she could finish several tubes in one seating (8 tubes in a box). It comes in different flavors - watermelon, strawberry, melon, paradise punch, berry and cotton candy. Regular price is $2.79 but it was on sale this week at my favorite supermarket for $1.49 each. It was the best time to stock up in my freezer. Beginning this summer, BK will launch a new coffee to its existing breakfast menu. It will add Starbucks Corporation’s Seattle’s Best Coffee to all its more than 7000 U.S. restaurants including the iced coffee. Variety of flavors like plain, vanilla or mocha and whipped toppings will be available and prices will range from $1 to $2.79. Once Burger King starts to sell Seattle’s best coffee, it will be the end for BK Joe coffee. We were watching the figure skating last night and when her name was announced as Amanda Evora, I was 100% sure she is Filipina. Her parents were at the audience supporting her and her partner Mark Ladwig. Amanda and Mark were silver medalist at the US National Championship which earned them a spot to be with the US team at the 2010 Winter Olympics in Vancouver. This is their biggest competition and they both stand on the 10th place. Amanda Evora was born in New York to father Vic from Calapan, Mindoro and mom Mary Ann from Isabela. She is the first full Filipino to be representing the U.S. at the Olympics. His name is J.R. (short for John Robert) Celski, a Filipino-American, born in Monterey California to a polish father Bob and a Filipina mother Sue. 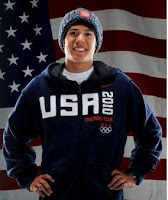 He is with the U.S. team and recently won a bronze medal in the 1500m short track speed skating with fellow American skater Apolo Ohno winning the silver medal yesterday at the 2010 Winter Olympics in Canada. This is Celski’s Olympic debut and his first big competition after a scary accident where he was injured on his thigh six months ago receiving 60 stitches. J.R. Celski was raised in Federay way, Washington, has 2 older brothers. He started with inline skating winning national titles and shifted to speed skating after watching Apolo Ohno became a star at the 2002 Olympic Winter Games. After the Vancouver Olympics, he will attend school at Cal-Berkeley. 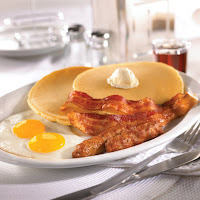 Go to any denny's restaurant in the U.S. today from 6 a.m. to 2 p.m. and get a free grand slam breakfast. I saw this ad while watching the Super Bowl last Sunday. Denny's have done this in the past and they are doing it again today. So if you live close to a denny's restaurant why not take this offer. Do not oversleep, you only have up to 2 p.m. If you miss this chance, go back to denny's on your birthday and get your free original grand slam as a birthday treat. January 12, 2010 is the day a lot of Haiti residents wish it did not happen. It is on this day that a 7.0 magnitude earthquake struck Haiti knocking down buildings and power lines; huge dust and smoke blanketed the whole city leaving people trapped under the rubble, killing and wounded thousands. We saw on TV, internet and newspapers how millions got displaced and needing whatever help we can give. Haiti needs our help. Cryo Cell International, the leading in cord blood banking service is doing something to help the victims of earthquake in Haiti. Through their Hope for Haiti “Save The Children:Haiti Relief Fund” Cryo Cell will donate $25 from each enrollment this whole month of February. If you enroll now at Cryo Cell’s cord blood banking service, you are safeguarding the future of your baby, your family and also help a family in Haiti. Through the Celle U-cord service, parents are able to cryogenically preserve your newborn’s umbilical cord blood stem cells for future medicinal use. Umbilical cord stem cells are known to have treated 75 different kinds of diseases, some are life threatening and have been used also in more than 12,000 transplants worldwide. To learn more about Cryo Cell and stem research, a lot of information are available at cryo-cell.com. Enroll now and bank your baby’s cord blood with Cryo Cell and help rebuild the future of Haiti children. This was the scene at the supermarket this evening. The parking lot was packed and you can feel the rush from people buying food in preparation for the storm and sunday's super bowl, salt or de-icer, shovels, snow blowers and ice scrapers. Everybody thinks that they won't be able to get out of the house tomorrow so you have to do what you have to do now. We are expecting around 6 to 9 inches of snow starting tonight until tomorrow. Southern parts of Jersey are expecting almost two feet of snow. It is for sure that we will be digging out snow this Super Bowl weekend. Looking back at my spending habits when I was single, I was not frugal at all. I go to a grocery store and buy my stuffs as I need them without even thinking if I was making any savings at all. The words “coupon” and “savings” never became significant to me. Everything changed when I started to have my own place and live independently. It became worst actually when I started to raise a family. Now as a mother, a week always start with the Sunday paper for my weekly coupons. I have always this in my mind ….save, save, save! When you have a baby, a big chunk of your budget goes to buying baby formula and diapers. They are not cheap and these are the things you cannot do without but there are several ways to minimize your expenses. Let’s start with the baby formula. Start using store brand baby formulas. Your baby still gets the same nutrition as the big know brands but with savings of as much as 40% per ounce. If you want to save more, you can do a Baby Formula Quiz at babyformulaquiz.com and get a $3 off coupon. You can also get a store-brand formula coupon by completing the name and address form at storebrandformula.com. Store brands nfant formula are available at leading retailers such as Kmart, Target and Walmart. Spread this good news to all moms out there. Get the savings you deserve now! So I went to Macy's last saturday, being the last day for the gift card. Thank god i saw the expiration. Oh it's not a gift card because a gc has no expiration but just a $10 card you can spend. I bought this pair of jeans and shirt for my daughter. It's on clearance at $6.99 each!!! You can't beat that. The original price was $19.99 and $24.99. Using my $10 gift, I only have to add $3.98 cash, no tax because jersey does not tax clothes if less than $100. Sweet!